Place onions in 3 1/2- to 4-quart slow cooker. 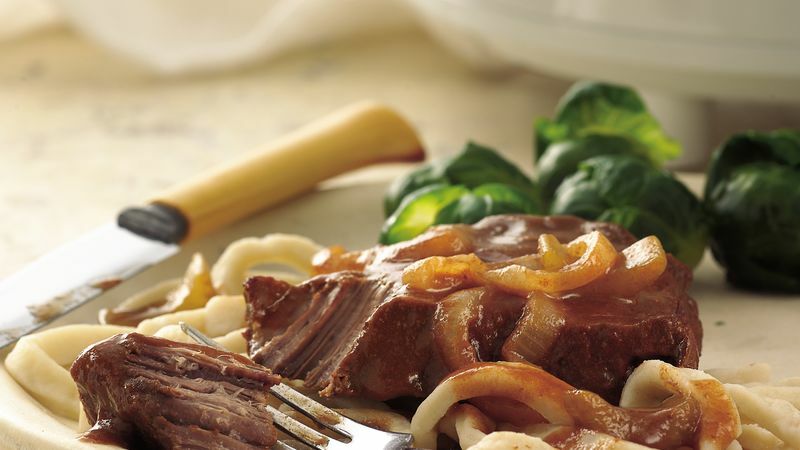 Arrange beef on onions, overlapping to fit if needed. Sprinkle gravy mix (dry) over beef. Pour vegetable juice over all. Place celery on top. About 15 minutes before serving, cook noodles as directed on package. Serve sauce, vegetables and beef over noodles. Serve on toasted French bread instead of noodles for a knife-and-fork open-face sandwich. Placing the celery on top gently steams it, keeping it tender and not mushy. Steamed fresh green beans are a tasty accompaniment.